As I have documented elsewhere, Abu Dhabi is in many ways a ridiculous place. However, they do know how to build golf courses to a very high standard. Without a doubt, the quality of build at Saadiyat Beach is up there with the best. They have spent a lot of money here so the quality of the grass is excellent and the greens were fantastic. 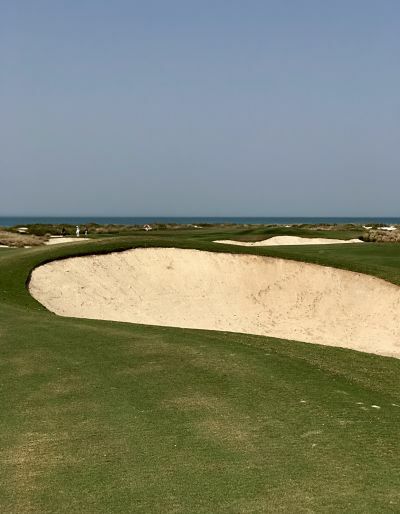 Considering we were playing at the peak time of the season, the week of the HSBC in the nearby Abu Dhabi Golf Course, it was close to faultless. The service was good. The food in the restaurant wasn't quite to Yas Links standard (but that would be hard to do) but they were very amenable to going off menu for the breakfast order. The range and short game area pretty good too and there were no excuses for not being warmed up on the first tee. This is one of the few courses I have come across where there is absolutely no walking. We did ask at the pro shop but the answer was an emphatic 'no'. There were too many people on the course you see which meant we would be slowing the pace of play down. There were also long walks from green to tee apparently. The whole thing was utter and complete balderdash - at least it has inspired a blog on the subject! We were able to drive the carts from the tracks to the ball on the fairway so that was some solace. To the course. I would say writing this a week later my memory is of a perfectly pleasant course with some perfectly pleasant holes. There is almost nothing about it that sticks out in my mind as being great but nothing truly awful either! It will come as no surprise that this being a course built in the desert there is a lot of sand. Many holes are flanked by sand all the way along the fairway instead of rough but on these occasions you can get out easily and make good forward progress. While the 'replacement rough' sand was perfectly reasonable I was less enamoured by the other bunkers on the course. Most of them seem to be put in the same place on every single hole - narrowing the fairway at the same point. We played the 6,700 yard tees and it seemed at almost every single par 4 the fairway narrowed acutely at the 210 to 240 yard marker with sand or water - the perfect landing area for most golfers of the standard to be playing from these tees I would have thought. After a while it became a little tedious and there were a few really odd second shots as a result. Maybe Gary Player would say that it made you think, but frankly it led to too many long shots in or splashes out of bunkers. For an amateur wanting to enjoy the round it took a little fun away. Longer hitters would be playing from the next set of tees further back so I'm really not sure who that was aimed at. The par 5 16th was one of the oddest par 5s you will ever come across with a drive, wedge and then a long rescue shot needed to get up - it didn't make for a pleasurable experience or good score! Around the greens you needed a sure touch and some of the grass was very fluffy so made it really hard to attack the ball but the contours were thoughtfully placed and rewarded imagination and a good putting stroke. The roll was fantastic and a delight to putt on. The setting was good, although nowhere near as spectacular as Yas. Several deer accosted us on the way around and the pace of play was fine. All in all there was little doubt that this was anything else than a 16 rated course - and not a massively high one, just good resort golf. It was hard to lose a ball out there unless you hit it in the water, the people were pleasant and it was the winter climate was perfect. 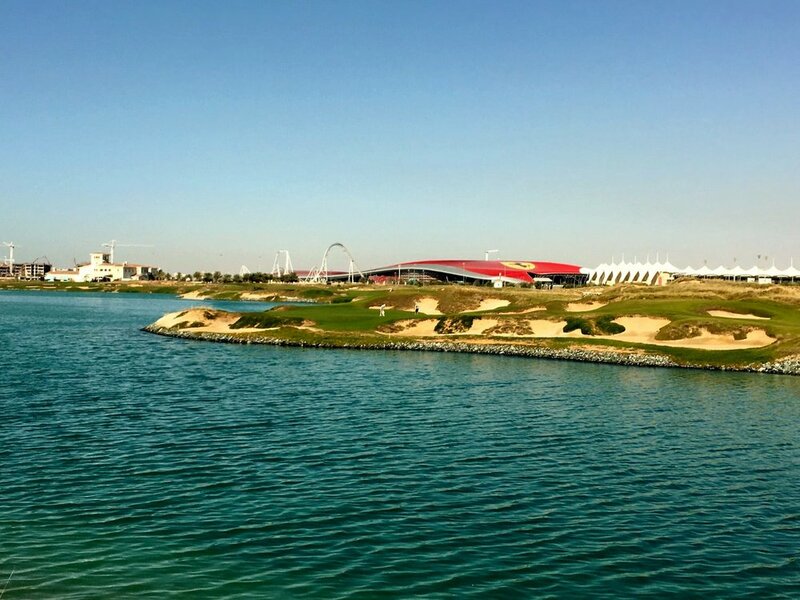 If you only have time for one game in Abu Dhabi head for Yas but if you want to add a second then it is a toss up between Saadiyat and Abu Dhabi Golf Club. We booked the course direct through their website and it wasn't cheap - £200 for the tee time which included the cart. However, in hindsight, there was a much better way to do it. The main tour operators all have great deals at Yas, Saadiyat and Abu Dhabi with good accommodation and flights thrown in so next time I think I would go that route and book through them. Abu Dhabi isn't as big as the sprawling mass of Dubai. We stayed at the Yas Island which is about 25 minutes drive away. This is an entertainment Mecca - we had a great meal overlooking the race track and there are plenty of great restaurants and bars around. Club Mad was a very surprising diversion for a couple of hours late on a Saturday night although we did feel a little old there! We timed out trip to go at the same time as the Abu Dhabi HSBC Golf tournament and went along on the Sunday which was fantastic. The viewing was brilliant as it was very quiet on the course and you could get very close to the players. The tented village was excellent and the whole atmosphere wonderful. They have done a great job with the event and I would thoroughly recommend the trip. They have even relaxed the rules on mobile phone cameras so I was able to get some good shots of the players as we went round. All in all a great way to end the trip. Even better, we had some night golf at Yas before an overnight flight back to the UK and in the office at 9am the next day!